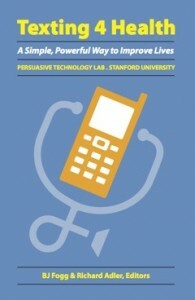 In 2008, the Stanford Persuasive Tech Lab hosted “Texting 4 Health,” the premiere conference on how mobile text messaging can promote better health. This topic matters because texting is still the only viable interactive channel for reaching people on a mass scale around the world. We created a book from the Stanford event, bringing together the best content in 15 easy-to-ready chapters. This book showcases applications, ideas, insights on using mobile text messaging to improve personal and public health. The book is now available via Amazon.